This is the... well, totem pole, I suppose, for Kanagawa prefecture's anti-passive smoking campaign. The motto is suwanai hito ni wa, suwasenai which would be well localized as "Non-smokers shouldn't have to smoke" or similar. Why is it a swan and an elephant? 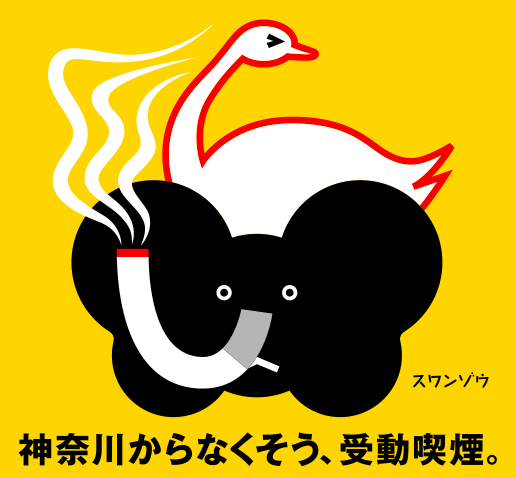 Because suwan ("swan") is the verb suu ("smoke") with a colloquial negative ending, and zō ("elephant") is an elongated zo, the sentence-final particle of emphasis and/or determination. Symbologically though this is kind of a mess. If its name is a pun on "I won't smoke," why is it smoking? Is that look on Elephant's face oblivious or malicious? If Swan hates Elephant's secondhand smoke so much, why doesn't he just get off Elephant's back? If Elephant's trunk is a cigarette, is it reasonable to place restrictions on how he uses it? (Can he even breathe any other way?) And of course there's the weird sense, created by the color scheme, that the trunk/cigarette is actually part of Swan, somehow poking through Elephant. Yeah, the "poking through" sense jumped disturbingly out at me too, which really makes the elephant the victim. Or maybe I'm thinking too hard. In the U.S., people in prisons manufacture license plates. In Japan, people in mental hospitals design antismoking signs (and freelance for many ad agencies). Here's a bilingual smoking etiquette sign that doesn't seem very coherent in either language. And the tendrils of smoke are like sabers, forcing the swan's face away! At least its memorable. Okay, or dig this: Swan's face is not "Ewwww! ", it's "Khhhh! ", the face you make after a big sip of cold beer. He LIKES the smoke. And Elephant is a zombie shell that he simply manipulates, hijacking the brain stem to get maximal elephantine smoke pumping. I could see that. The cigarette is actually an Aliens esque stabbing mouth that just did in the elephants cranium, thus the stunned look. The point of those posters is that being rude is worse than cancer to Japanese people. @Carl: Ah, that does seem to be the most effective message. But I can't make much sense of 'Posters saying "Don't litter with cigarette butts" are like children scolding adults with paint brushes' even if I rephrase it to 'children with paintbrushes scolding adults'. Does it mean to imply that antismoking posters are childish and rude? I was torn between "Khhhh!" and "Qoo! ", but the latter is trademarked. I think it means, these posters are a message from children telling adults to shape up. But yeah, that's pretty inscrutable. The untranslated bit on the sides of all the posters is clear though: 'if you were more aware, you'd mind your manners.' The campaign clearly thinks social shame is more motivating than fear of cancer. To be fair, those posters are from Japan Tobacco. They don't want people to become afraid of cancer and stop smoking altogether. They just want people to smoke more considerately so that non-smokers won't rise up in irritation and (via laws and taxes and so on) make smoking increasingly expensive and difficult, as has happened in the US, UK, etc. what does the text at the bottom of the poster say? Let's get rid of second hand smoke from Kanagawa.